If you're in need of a quick snack, buying peanut butter crackers from the vending machine is convenient, but it's not wise to make a habit of eating these crackers. Peanut butter crackers are high in calories, sodium and saturated fat, while offering minimal quantities of fiber, vitamins and minerals. One package of peanut butter crackers of six crackers, provides approximately 190 calories. Nearly 45 percent of these calories are from fat, with protein making up less than 10 percent of the total calories. Nearly half of the calories in peanut butter crackers are from carbohydrates. 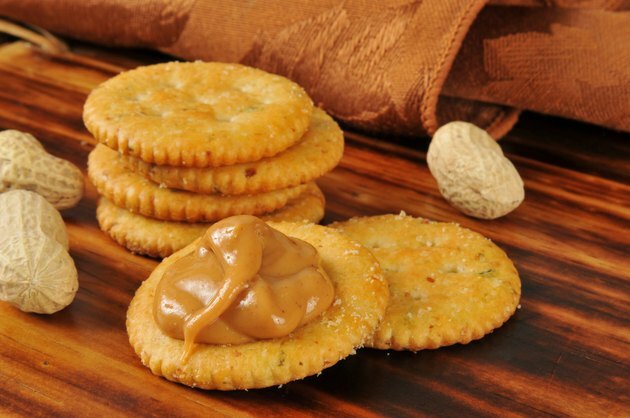 Peanut butter crackers are relatively high in sodium, which could lead to high blood pressure if you regularly consume a lot of sodium from other foods. You'll get about 300 milligrams of sodium from a six pack of peanut butter crackers, which is more than 13 percent of the 2,300 milligram daily limit suggested in the "Dietary Guidelines for Americans 2010." If you usually consume a lot of saturated fat, your cholesterol could rise, as could your risk of heart disease. Some varieties of peanut butter crackers have nearly 2 grams of saturated fat. Since a 2,000-calorie diet means that you shouldn't have more than 22 grams of saturated fat a day, one package of peanut butter crackers makes up nearly 10 percent of this amount.